Tonight after the basketball game, nice job Cats, I decided to swing by my parent's house for a visit. 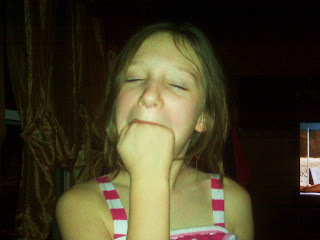 As I am visiting my niece Dae comes over to me and asks if I can put my fist in my mouth. I told her this was not an ability that I possessed. She then followed her question up with the boasting statement, "I can." This is the picture of the day.